Batman is back in action in his latest feature film, The Lego Batman Movie. This time around, he must defend Gotham City from the Joker, while trying to raise his adopted son and face the demons of his past. When all hope seems lost for Batman in any future media whatsoever, Warner Bros. Animation comes to the rescue with an entertaining and satisfactory action flick. This follow-up to The Lego Movie holds on to what made the first one so successful, but also brings in a new tone, and that’s mostly due to its protagonist, who steals the screen once again. From the moment the film begins, I could tell how self-aware and clever the humor in the film would be, with Batman spoofing everything from other Warner Bros. media to other incarnations of himself. Will Arnett is a hilarious and terrific pick for the caped crusader. I don’t remember ever seeing Arnett actually do well on the big screen besides in these films. He truly embraces the character and what makes him great, and he delivers lots of humor very well. Michael Cera joins the cast of Lego superheroes as Batman’s young sidekick, Robin. Cera is quirky but oddly lovable and fun, and I’ve seen Cera play live-action roles like this in the past, so he was definitely a great choice to play the character. Zach Galifianakis is outrageously hysterical and amusing as The Joker, with his portrayal of the iconic villain being different but amusing for the sake of a family audience. Ralph Fiennes was a great choice to voice Alfred, and Rosario Dawson, who isn’t new to playing sidekicks to superheroes, also gives it her all in her role as Gotham police commissioner Barbara Gordon. One thing that made me so delighted by the film’s humorous approach was the way it poked fun at itself and all of media out there, from Suicide Squad to Harry Potter to even Jerry Maguire. Whenever the humor wasn’t aimed to get laughs from kids, it was always finding ways to reference and spoof films and shows we all know, and it almost felt like a family edition of last year’s Deadpool. Another noteworthy point about the film is its great message for kids, about family and teamwork. It embraces a lot of what hasn’t been explored too much about Batman and uses it for great themes that could inspire viewers, especially younger ones. However, as the film started to throw more at you and advance further into its runtime, it became easier to predict how everything would go at the end. It borrows some overused cliches from other animated films that nothing feels like a surprise by the end. Some of the action feels very empty and unengaging, just because nothing about it feels original and new. Kids will most likely be intrigued by everything that happens in this movie, but I felt like some of it was too familiar and similar to what we’ve seen in family films before. If you take your kids or a younger audience to watch this movie, you’ll probably have a great time seeing it with them. However, some of the predictable elements in this movie bothered me at one point in the runtime. 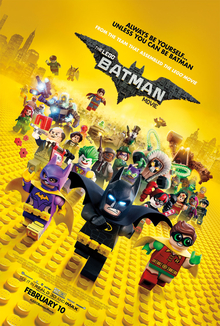 Also, there were some ideas thrown out there by The Lego Movie that could have been explored more in this one, but instead it chose to stick to being a Batman film, which I was mostly fine with because it’s trying to be its own film. Don’t expect this to be the exact same experience as The Lego Movie, since there’s a reason this is a spin-off and not a sequel. The Lego Batman Movie is guaranteed to be a great time for families, with a great cast, humor, and themes, but some of it feels too predictable and recycled to the point that it becomes slightly uninteresting. It doesn’t have as much to offer as The Lego Movie, but it’s a fun time for families and especially younger audiences.